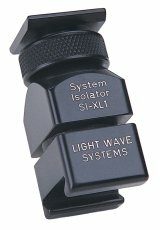 The SI-XL1 system isolator is a multi-purpose isolator coupler specific to the Canon XL1 camcorder. The SI-XL1 is designed to provide shock and vibration isolation to the XL1 viewfinder and microphone mount assembly system of the camera. The SI-XL1 can be attached or removed instantly, as the unit utilizes and conforms to the Canon method of slide assembly, positioning and locking. It can remain on either the camcorder or viewfinder if separation is made for compact travel packing. Distinct reduction of mechanically transmitted motor noise and operator handling noise, or shock to the microphone. Even the finest mechanisms generate an amount of bearing rumble and whine, producing a variety of high and low frequencies that combine into unwanted harmonics. Effective microphone isolation brings presence to the audio gathering process. Full isolation is accomplished by using the Mini-mount. The SI-XL1 isolates both the camcorder body and viewfinder assembly unit from physical damage that can occur when an unintended bump or jolt strikes one of these, relative to the other. The SI-XL1 will enable angular displacement in all directions including rotational twist. The viewfinder and camera operator�s face have a large degree of protection from any sudden displacement of the camera body and lens mass. As a coupler, the SI-XL1 body length has been set at 2.375" (60 mm) to customize the camcorder balance point. Moving the viewfinder by this distance forward equates to moving the camcorder back by this same amount, where the flat base section of the unit rests in a natural balanced carriage on the shoulder. The camera body/lens weight factor is removed from the operators arms, resulting in a relaxed operational mode. The upper arms of the operator are now close to the chest, enabling a steadying support from the arms. Unit weight: 2� ozs. - 73 g.
Silence can be a speech.